Bowie liked it. I can see why. It's about a woman living in communist East Berlin attempting to reconstruct the life of her dead friend via the notebooks and jottings she left behind. There is so much unsaid, so much neither the reader nor the narrator can know about this person who has passed. The descriptions of East Berlin rhyme with Trump's America, a time when we're unable to recognize our country, our friends and neighbors, our own lives. For fans of Lispector, Chris Kraus, Ferrante, and Walser. 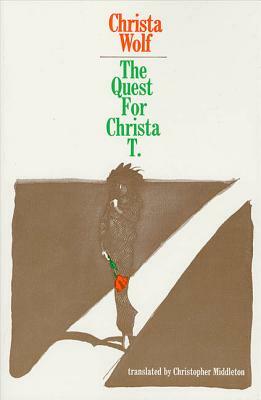 When The Quest for Christa T. was first published in East Germany ten years ago, there was an immediate storm: bookshops in East Berlin were given instructions to sell it only to well-known customers professionally involved in literary matters; at the annual meeting of East German Writers Conference, Mrs Wolf's new book was condemmed. Yet the novel has nothing eplicity to do with politics. Christa Wolf (1929-2011) was one of the most celebrated German writers of the twentieth century. Wolf was a central figure in East German literature and politics, and is the author of many books, including the novels The Quest for Christa T., Patterns of Childhood, and Cassandra. Christopher Middleton is a poet and translator of Nietzsche, Goethe, and Robert Walser's third novel, Jakob von Gunten (University of Texas Press, 1969). He is the recipient of the Schlegel-Tieck Translation Prize.